"A multitude of men and women have come to challenge the sincerity and moral value of the combination of reverence and disregard which does not permit a woman to fulfill her traditional obligation to the community simply because to do this she must participate in political life. 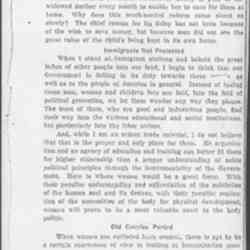 "If women would bear their share in those great social problems which no nation has yet solved, but which every nation must reduce to political action if it would hold its place in advancing civilization, they are fairly forced to choose between standing for an impossible ideal, quite outside of the political field, or upholding moral standards within political life itself. "In fact, we constantly see that the women who use their leisure for useful activity develop a growing desire for citizenship, while the others tend toward complete detachment and irresponsibility." 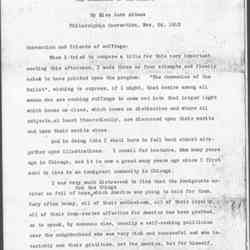 An excerpt from Addams' speech to the National Woman Suffrage Association meeting in Philadelphia on November 24, 1912. 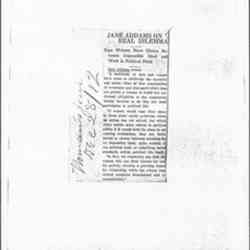 Jane Addams on Real Dilemma, Woman's Journal 43 (December 28, 1912): 414. 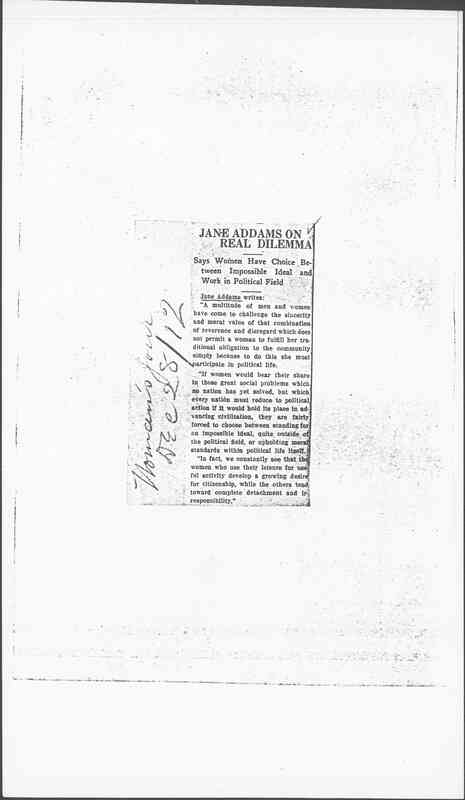 Addams, Jane , “The Communion of the Ballot, December 28, 1912 (excerpt),” Jane Addams Digital Edition, accessed April 22, 2019, https://digital.janeaddams.ramapo.edu/items/show/8943.